Sunset Theater: Have You Motion Picture Talent? This particular advertisement for the Portland Oregon theater is unique in its promotion of a talent scouting contest. “Have You Motion Picture Talent?” the advertisement asks in large bold letters, prominently outlining the opportunity for “three boys” and “three girls” to be chosen to take part in a motion picture created by the Oregon Film Producing Company. Each Portland high school is set to nominate pupils from their institution to be shot in a “characteristic pose in motion picture” to be shown onscreen to voting attendants at the Sunset Theater. 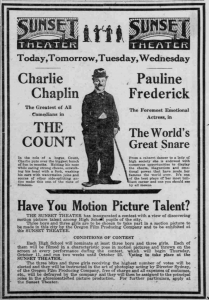 While the prominent image of Charlie Chaplin promotes the theater’s current screenings for the week, the promotional motion picture contest proves that theaters were more than merely a place to watch films in Oregon in 1916. The Sunset Theater is one of many theaters in Oregon at this time to be involved in the culture and community of moviegoing. Interaction with members of the community by holding a competition for high school students indicates the popularity of film with younger audiences, or an attempt to attract a younger demographic to moviegoing. 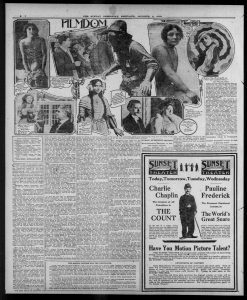 Unlike advertisements of today, which commonly include contact information and addresses, both are unavailable in this piece. Times of screenings and cost of tickets are unspecified, and further research is required to find the original location of the Sunset Theater. Sunset Theater. 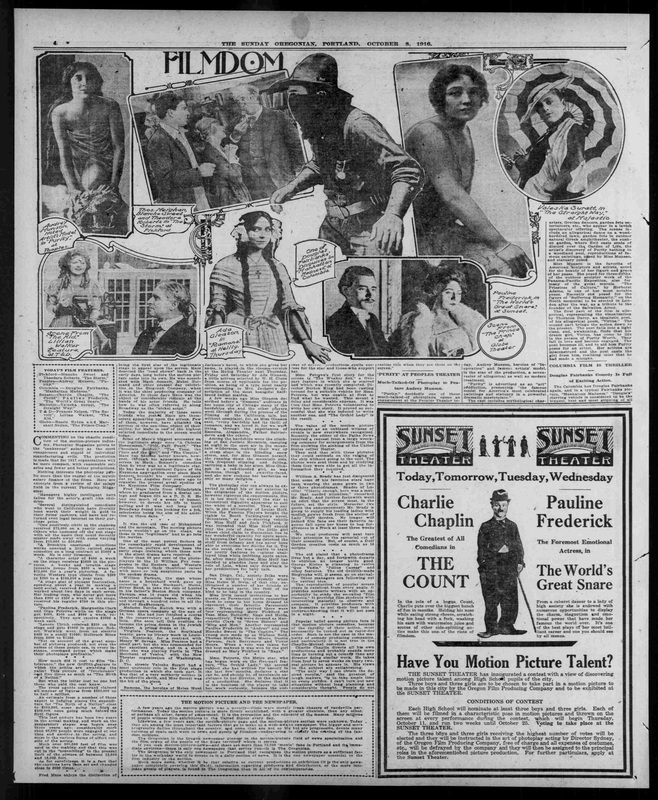 “Have You Motion Picture Talent?” The Sunday Oregonian [Portland], 6 Oct. 1916.